This entry was posted on Monday, January 13th, 2014 at 1:01 pm. You can follow any responses to this entry through the RSS 2.0 feed. Both comments and pings are currently closed. We need a hat competition !! Please post an address that we can post hats to. You could send the knitted kitten to whoever sends the silliest ! Seriously hope Chemo#2 is gentle on you and tough on the cancer. Hm… as charming a sentiment as that might be, I’m just not a silly hat person. I know! Kind of surpring. If you read just my books you’d think: No, not a silly hat person. If you read only my blog, you say: Obviously, a silly hat person! In fact, nope. I’ll pass on the silly hats, but thanks for the cheery thought! Chemo #2 turned out to be just a bit tougher than #1. I can see a trend, but it’s already 2 down and only 6 to go. Live-blogging your chemo–that’s very modern of you. So you’re still cutting edge even if your hair has decided to go off the grid. Hats? Scarves? A wig? Have you already made a decision, or are you going to experiment? 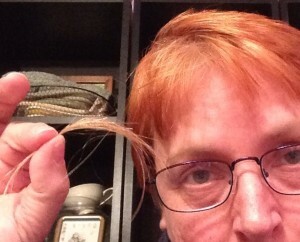 My hair did the same thing when I was having chemo (except it waited until after my second session). 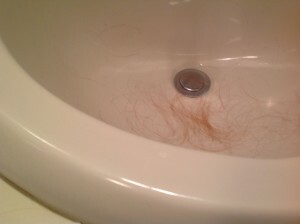 I spent one evening plucking myself bald; it was oddly satisfying. Oh no! Another case of early onset (breast?) cancer. Get Well Soon! PS: this kind of thing is why I can't stand the vitriol against Lance Armstrong. The guy beat cancer! It's hardly a surprise he needed a lot of meds–even "illegal" ones–to compete in Tour de France after that!